It was the day we had been looking forward to. After months of singing, dancing and rehearsing, Angel was going to perform for the second time at her annual school concert. Why, this time, even the little sister had learnt all the dance steps because we practised so much at home and that was something hilarious and yet classic when the two of them danced together. It was regrettable that the hubby was away and thus the girl would not be able to perform live in front of her daddy. 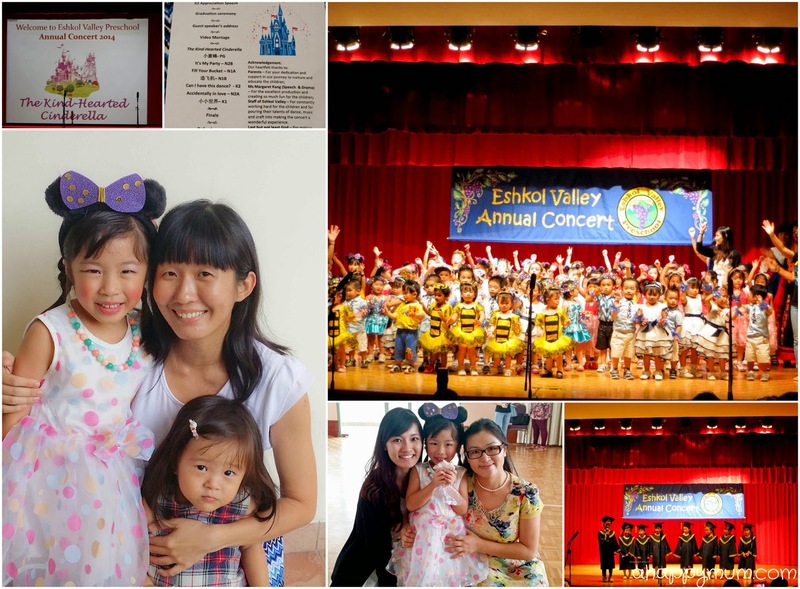 Nonetheless, I had told her she would need to do her best because not only was Mummy going to record the whole performance down to show Daddy, I also brought with me the entourage of grandparents. Yup, both my parents and in-laws were there to support and cheer her on! Wouldn't you love to see your grandchild performing when you are a grandparent too? I would think so. I had sent Angel to school at 7:30am that morning and was full of anticipation when I arrived at the theatre. What amazed me was that even though we were 35 minutes early, all the front seats were already taken up and we could only settle for a middle row seat. Wow. That made me think hard about how early I have to come when it is my girl's turn to graduate next year. Although her dance was the finale performance for the concert, we were very much entertained throughout by the dancing and skit put up by all the other students. I especially loved to watch the kids in the playgroup (18-24 months) dance, or rather sway, because they looked way too adorable. And when it came to the Kindergarten 2 kids, who were dressed in their graduation gowns and mortarboards, to give their thank you speeches, I don't know why but tears started to roll down my cheeks. They spoke on friendship, teachers, school life and the things that made them grateful. Although I know the text probably came from the teachers, they still tugged at my heart and I felt every bit of those emotions on a Saturday morning. I'm not sure if the tears were those of joy, a realisation of how fast time flies or because I was genuinely touched by everything that happened. Likely all of the above. And wait, these were not even my kids but I felt them. I really did. What will happen when it is my girl's turn to take it to the centre of the stage and give her speech next year? I don't know. But I'm pretty sure I'm gonna need more than one packet of tissue. That's the thing about firstborns, right? You go through so many milestones, achievements and unforgettable moments with them that you are not sure how your heart can withstand it sometimes. I'm not saying that the second child is any less important but at least you are more of an expert in controlling your emotions when that time comes. But for the first child, you really don't know when these feelings start to stir inside you and you also can't stop yourself from being overwhelmed when they decide to gush out. So that day, I was once again a proud mama and I was secretly happy that the moment the stage curtains opened, she gazed around for me and once our eyes met, they never left each other. In fact, it seemed like I was the one who was giving her the confidence and the motivation to carry on dancing. And she, she never stopped smiling her happy smile and never showed any sign of fatigue or giving up. Like what I wanted her to do, she enjoyed the whole show from start to end and that, to me, was the most important thing. Dear Angel, I just want you to know you did a most awesome job and would have made any mummy proud of you. Of course, I'm so glad I happen to be your mummy and it's really my good fortune to have you in my life. You were like a gem that day, shining bright on stage and lighting up my world. You see, hard work really does pay off and for all the efforts you put into rehearsing, they helped to shape you into a better, stronger and more confident girl. Time flies and next year, you will be graduating from your preschool and bidding farewell to all of these friends whom you love dearly. You will move into another phase of life and though there will be challenges and setbacks lying ahead, I know you will learn to overcome them one by one and grow up into the mature, independent and kind girl that you are deep down. The world is small yet big at the same time. I am thankful we found each other. Or like what you always say to me nowadays, I love you from head to toe. Angel did a great job! I just attended my girl's concert recently and I don't know why but I got really nervous when she was about to perform. It was the same kind of nervousness that I encounter whenever I have to give a presentation.